Visiting the Yorkshire Dales? 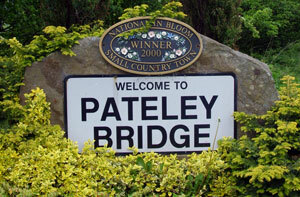 Then come and explore the charming little town of Pateley Bridge. Nestled in the heart of Nidderdale, which is an Area of Outstanding Natural Beauty you can experience all the charms of rural life as well as visit numerous attractions in and around the local area. Pateley Bridge is the perfect place to start your exploration of the Yorkshire Dales, to enjoy the stunning scenery which brings visitors back year after year, no matter what the season. We can guarantee you won’t be short of things to see and do. Pateley Bridge is the starting and finishing point on the Nidderdale way, a circular route which covers 53 miles, looping around the stunning scenery of the Nidd Valley. Here you can take in some spectacular landscapes in an area which is renowned for its floral beauty and charm. Pateley Bridge is the perfect place for a base, offering plenty of accommodation, from small cottages to hotels as well as plenty of places to eat where you can experience local cuisine and delicacies. There are also numerous quaint local shops and tea rooms which are most welcoming to visitors and no visit to Pateley would be complete without a stop of at England’s Oldest Sweet Shop to stock up on your favourite traditional sweets from childhood. For those who are eager to find out about the history of the area and want a real feel of rural life, past and present then you can visit the Nidderdale Museum. Based in the Original Victorian workhouse, the museum houses a cobbler’s shop, school room and relics and artefacts, depicting the Yorkshire way of life. If you’re visiting us in September then one event not to miss is the Nidderdale show, which is an agricultural event held annually on the Pateley showground. The Pateley Bridge Show is one of the finest shows held in the North of England, every year boasts an array of marquees, events and stalls offering a variety of things to see, buy, taste and do for not only locals but visitors as well. Getting out and about from Pateley Bridge you can explore some of the more surreal and unusual landscapes the area is renowned for, such as Brimham Rocks, Stump Cross Caverns and How Stean Gorge, plus many, many more sights. So the only question is, what are you waiting for?